Calm down. I’m OKAY. There was remarkably little blood. 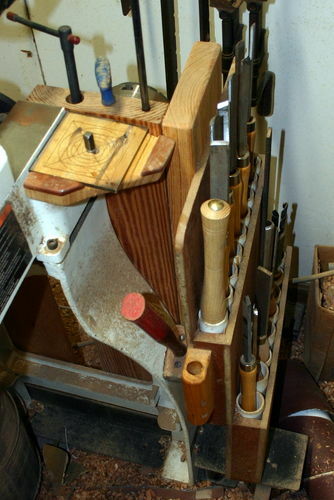 Back when I got the Shopsmith and the tools that I began accumulating at that time, I made a tool rack. It was pretty well tailored to the two original sets of ordinary tools I had. Over time, tools joined the ranks that didn’t fit in this, either because they were too long or too fat, or whatnot. So, having lots of other, unrelated things positioned about the Dungeon meant that tools got laid down here and there. 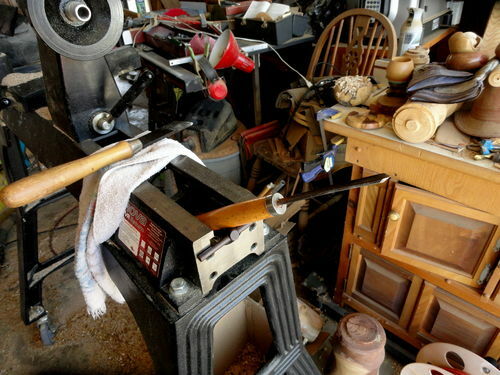 The place that became the main repository of my turning tools was on top of an old microwave that was perched across the arms of a glider I had rescued from sidewalk oblivion some time ago. I spread a big bath towel over the top of said microwave and simply lined the tools up across the towel. That worked pretty well. When I got my new lathe on May 19th. Something had to give. I needed room. So, when I began preparing to move the SS out, I decided that the glider, along with the other glider that sat next to my workbench, covered with clutter, would be better off in a thrift store. To the thrift store they went, along with the microwave, along with the handy place I had kept my turning tools for so long. Sharp tools are all that and a jar of pickled pigs’ feet, to be sure. But, when they’re sticking up, they look for something to cut. I’m using the indexing feature on my dandy new new machine to mark equally-spaced positions on a piece I’m turning. Five or six minutes elapsed before even a drop of blood was shed. Remarkable. Sometimes – nah, most of the time – I’m convinced that my meaning in life is to serve as a warning to others. I treat any self inflicted calamity as a learning experience. When you can walk away from this with just a little blood loss consider yourself fortunate and vow not to be a stupido. Mark, I know about stupid. It costs money and there is often some blood involved hopefully just mine. I liked reading your story. Nice job of writing. Last week I managed to lower my old and heavy 16’ x 12’ shop garage door onto my rolling scaffolding. Stupid. This meant the door stopped and the operating motor kept spinning so the cable that moves the door up and down came off the pulley system. I heard the sound of the door lowering and stopping and the motor running as I was walking away from the shop. And I knew. Without turning around to look, I knew just what had happened. Stupid. Time to call the door repair guys. They came at 9:00 the next day and fixed the problem. Bless them and the truck they rode in on. There was $200 worth of stupid involved, and I got off cheap. Torsion springs are not what I want to do. Even I am not that stupid. Just as a way of sharing information, I have had good luck with my rack for turning tools . It uses a row of plastic pipes that fit the handles. The pipes fit into an oblong box. The bottom board of the box acts as a stop. 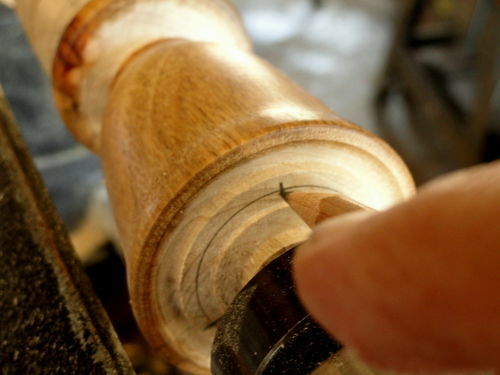 It hangs from the lathe. 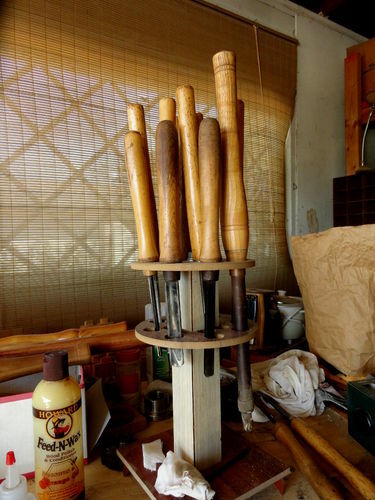 The handles are all of similar size, and I can see the shapes of the tools easily. The sharp edges are up, but there is enough of the tool exposed so that I can pick them out from the side. The pipes keep all the tools parallel and any tool fits any space. 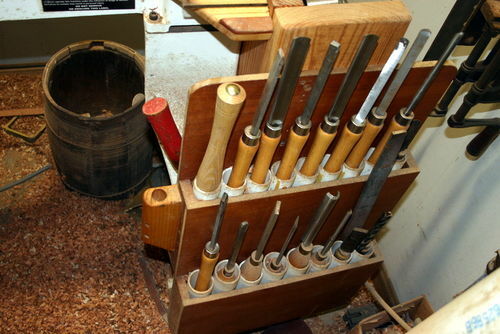 Not great pictures, but my lathe lives in a crowded corner. Hopefully, they will be enough to convey the idea. 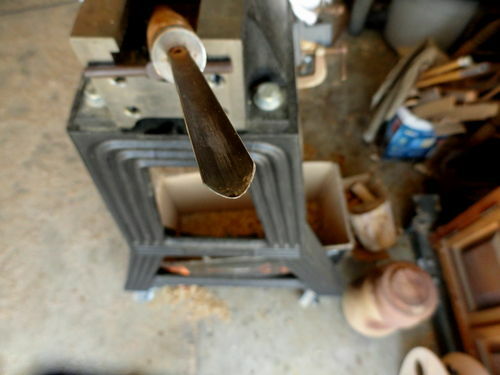 Happy turning. your warning is well recieved,im glad to see it was only minor.i think were all probably guilty of doing something we know we shouldnt.you just cant take being safe in the shop lightly.thanks for posting this buddy we can never be reminded too much. Ah, yes, pointing at ya can cause injury. That is why when I was an apprentice toolmaker, they always taught us to load your drills in a drill index point down. I have used other ones that are pointed up and get poked or scraped reaching for a drill. The one thing I did with all my lathe tools is have the top ones pointing down with the ends exposed so I can see what they are. The long ones lay flat with the backs out and I put an initial on each one to let me know quickly where the one is I want or I can see the business end too. It works well for me and I never get poked! Well at least there weren’t any stitches involved. Mark, all I can say is ouch. But I guess you won’t do that again in a hurry. The problem with lathe work or any machinery work is it can happen before you realise it. Lew, Lew, Lew. Always the practical one. But, isn’t that a lot like laying them on the lathe bed? Nonetheless, it gave me an idea. Thanks. I’ve done things that i shouldn’t. Not thinking or being careful. Also loose things if i get too focused. Oh yeah that’s where I put it.” For safety and memory issues I clean up every day when leaving the shop. When it’s an outside project my benches, floors etc become dangerous black holes. Good that it was not life threatening and only mind altering. Yeah, Dark. You made a noteworthy point in there that comforts me, somewhat. About sharpness. 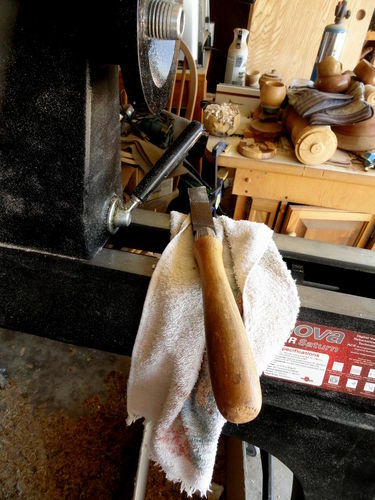 Never having actually used a tool that anyone else sharpened – except for “factory sharpened” situations, – I often wonder how sharp my tools really are. 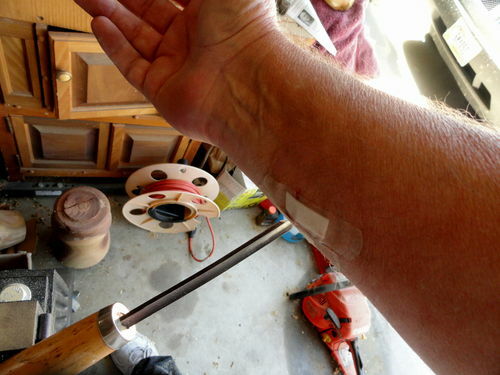 I didn’t really feel the thing slicing my arm open. I guess that means I did a pretty good job, huh?